John George Nicolay (February 26, 1832 – September 26, 1901) was a German-born American who served as private secretary to US President Abraham Lincoln and later co-authored a biography of the 16th President. He was a member of the German branch of the Nicolay family. He was born Johann Georg Nicolai in Essingen, Rhenish Bavaria. In 1838, he immigrated to the United States with his father and attended school in Cincinnati. He later moved to Illinois, where he edited the Pike County Free Press at Pittsfield, and became a political power in the state. Then he became assistant to the secretary of state of Illinois. While in this position, he met Abraham Lincoln and became his devoted adherent. In 1861, Lincoln appointed Nicolay as his private secretary, which was the first official act of his new administration. Nicolay served in this capacity until Lincoln's death in 1865. Shortly before his assassination, Lincoln appointed Nicolay to a diplomatic post in France. After the death of the President, Nicolay became United States Consul at Paris, France (1865–69). For some time after his return to the United States, he edited the Chicago Republican. He was Marshal of the United States Supreme Court (1872–1887). In 1881, Nicolay wrote The Outbreak of the Rebellion. Nicolay and John Hay, who had worked alongside Nicolay as assistant secretary to Lincoln, collaborated on the official biography of the 16th President. It appeared in The Century Magazine serially from 1886 to 1890 and was then issued (1890–94) in book form as ten volumes, together with the two-volume Complete Works of Abraham Lincoln. The resulting biography is a definitive resource on Lincoln and his times. Nicolay and Hay also edited Lincoln's Works in twelve volumes (1905). Finally, Personal Traits of Abraham Lincoln was published by Helen Nicolay in 1912.
we hold that your father was something more than a mere make-weight in the cabinet....We want to show that he formed a cabinet of strong and great men—rarely equaled in any historical era—and that he held, guided, controlled, curbed and dismissed not only them but other high officers civilian and military, at will, with perfect knowledge of men. 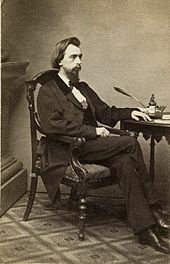 Nicolay was a founding member of the Literary Society of Washington in 1874, according to a book about the society written by his daughter, Helen Nicolay. Both Nicolay and Hay were members of long standing in the society. Poor health had forced Nicolay to resign as Marshal of the Supreme Court, and he suffered from a wide range of ailments in his final years. He lived with his spinster daughter, Helen Nicolay, at her home at 212 B Street SE in Washington, D.C. He died at home of unspecified causes on September 26, 1901. He was buried at Oak Hill Cemetery in the city. In the 1992 documentary Lincoln, the German-born Nicolay is voiced by the Austrian-born actor Arnold Schwarzenegger. In the 1988 NBC mini-series Lincoln based on Gore Vidal's book, Nicolay is portrayed by actor Richard Travis. In the 2012 film Lincoln, Nicolay is portrayed by Jeremy Strong. In the 2017 documentary film The Gettysburg Address, Nicolay is portrayed by actor William Fichtner. Nicolay, John Geeorge; Hay, John (1914). Abraham Lincoln : a history, Vol I. New York : The Century Co.
—— (1914). Abraham Lincoln : a history, Vol II. New York : The Century Co.
—— (1914). Abraham Lincoln : a history, Vol III. New York : The Century Co.
—— (1914). Abraham Lincoln : a history, Vol IV. New York : The Century Co.
—— (1914). Abraham Lincoln : a history, Vol V. New York : The Century Co.
—— (1914). Abraham Lincoln : a history, Vol VI. New York : The Century Co.
—— (1914). Abraham Lincoln : a history, Vol VII. New York : The Century Co.
—— (1914). Abraham Lincoln : a history, Vol VIII. New York : The Century Co.
—— (1914). Abraham Lincoln : a history, Vol IX. New York : The Century Co.
—— (1914). Abraham Lincoln : a history, Vol X. New York : The Century Co.
^ Gilman, D. C.; Peck, H. T.; Colby, F. M., eds. (1905). "Nicolay, John George" . New International Encyclopedia (1st ed.). New York: Dodd, Mead. ^ Doris Kearns Goodwin, Team of Rivals, p. 705. ^ Wilson, J. G.; Fiske, J., eds. (1900). "Nicolay, John George" . Appletons' Cyclopædia of American Biography. New York: D. Appleton. ^ Joshua Zeitz (2014). Lincoln's Boys: John Hay, John Nicolay, and the War for Lincoln's Image. Penguin. p. 280. ^ Nicolay and Hay are listed in the directory of members of the society in Helen Nicolay's Sixty Years of the Literary Society, Washington, D.C., 1934. Library of Congress call number PN22.L53 N5. Google Books . ^ "Death of John G. Nicolay". The Washington Times. 27 September 1901. p. 2. Retrieved 17 March 2015 – via Newspapers.com. ^ Keller & Spring/Summer 1999, p. 75. Joshua Zeitz (2014). Lincoln's Boys: John Hay, John Nicolay, and the War for Lincoln's Image. Penguin. Zeitz, Joshua (February 2014). "Lincoln's Boys: John Hay, John Nicolay and the War For Lincoln's Image". Smithsonian. 44 (10). Keller, Marisa (Spring–Summer 1999). "Oak Hill Cemetery Marks 150th Anniversary". Washington History: 75–76. Allen Carden and Thomas J. Ebert (2019). John George Nicolay: the Man in Lincoln's shadow. University of Tennessee. Helen Nicolay (1949). Lincoln's Secretary: a biography of John George Nicolay. Longman's Green.